It’s a problem. My Neumade slide cabinet already has quite a few American Copper butterfly images, and each time I go to cull out several, I end up keeping almost all. Culling is a dirty business, and I just can’t pitch good images to the trash. Can’t. Then here I was, on September 4th, 2014 in Doak Field, Raccoon Creek State Park. Haven’t done a presentation there for, what is it now, 2 years? Nevertheless it is terrific for butterflies, has diverse habitat, I once saw a Goatweed leafwing there, and . . . I just love Doak field, all 100 acres of it. 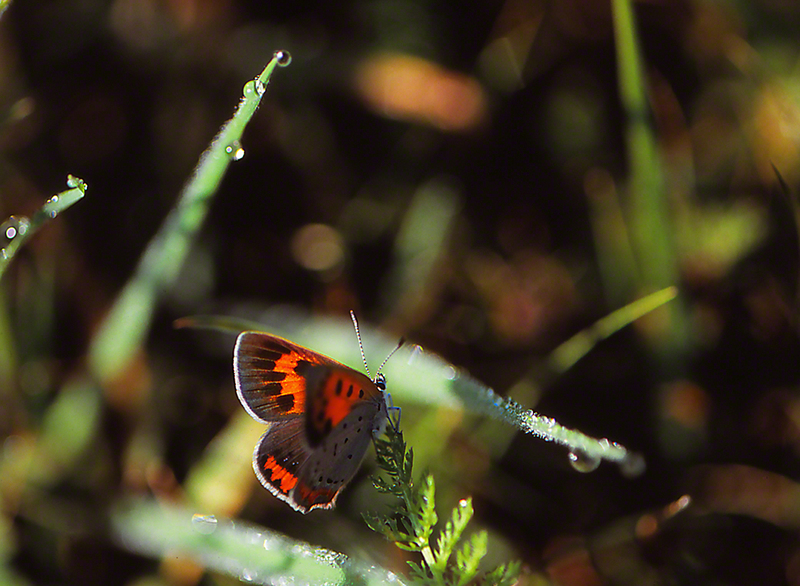 This Lycaena Phlaes flew from the mowed trail, onto this very nearby shoot. 1/1,000,000th of a second internal debate, then decision, way too beautiful to not attempt a keeper of an image. Crisp, sharp spots, borders, contrasts. My loyal followers know that I am fond of this butterfly. Winter antidote? Absolutely. Spring is coming, the ticking of the clock assures that. Winged beauties like this one will soon be on the wing. Love. Late summer in a 100+ acre field in Southwestern Pennsylvania. I went there almost every day for 2 weeks. This September 5th, 2014 view was in the southeastern margin of the field. Wildflowers grew along the treeline. Nectar? More than enough for the butterflies, flies, wasps, bees, moths and ruby-throated hummingbirds that worked the field. If. If I would have counted the number of goldenrod blossoms in the entire field, I would say a reasonable count would have approached, 10,000,000. 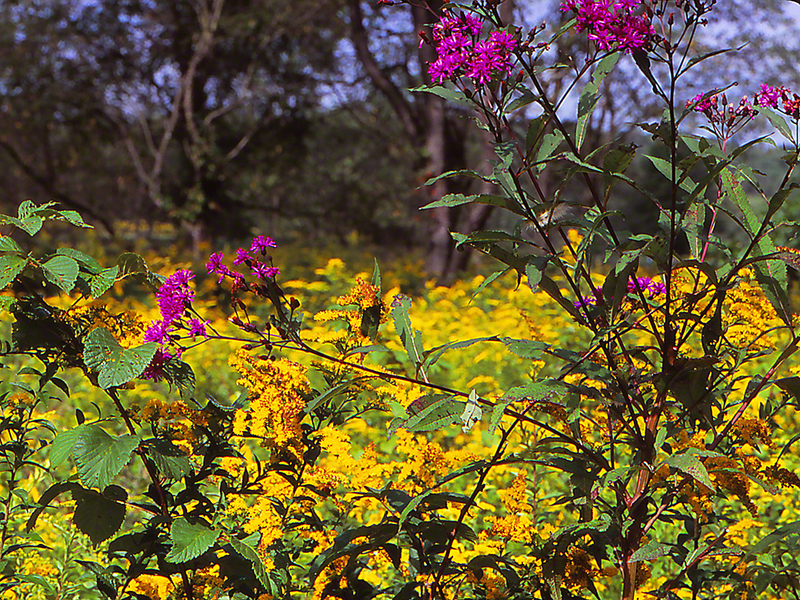 The purple New York ironweed plants were few in number and strategically located, for reasons of their own, no doubt. Three hours in the field that day, and, not a single other person about. Monarchs flew there that morning. Why weren’t you there? Is Shining Your Shoes Passe? Traffic here from guys under age 40? Light, I would say. So I’ll share the thought. Here in Doak Field, Beaver County, Pennsylvania, on September 5th, this sizable Great Spangled Butterfly was now out from the woods, and she wanted to warm her wings in the early morning sunlight. That quick mental tug-of-war resolved, I decided to work to capture yet another image of these huge Fritillaries, and hopefully . . . best those that I already have in my Neumade slide cabinet. Fort Dix, New Jersey and Fort Sill, Oklahoma got me into shining my boots daily, a habit that I have now relaxed into a weekly chore. I have always loved rich chocolate brown leather shoes, and used to love my chocolate brown suits, but they have long slipped into “No one wears them anymore-ville.” Also, I’m guessing that men under 40 don’t shine their shoes and perhaps never did. Our Speyeria Cybele totally evokes my shoe shining rituals. Could it be that rich brown that triggers that wired thought? Butterflies all evoke thoughts and snippets of memory for me. Do they for you, too? She’s about the same as you’d see her in Eatonton, Georgia or Crockett, Virginia, as well as up in Maine and usually down to the Western sides of both North and South Carolina. (Cech and Tudor, Butterflies of the East Coast). I thought that it was too late in the season to meet up with the Satyr butterfly, but here we are together, on an August 2014 morning. They are sooo predictable, flying just above ground, just where forest meet trail. They almost never fly onto the trail, always moving along the outer tree line. When you see Megisto Cymela and you’re like me, camera at the ready, there’s that predictable debate = Jeff (to myself), you already have several good images of this satyr, save your film (Fuji slide, ASA 50 or in this case ASA 100). You see the result, the boy in me wants to capture those eye spots, besting any in the slides in my Neumade slide cabinet. Time to vote? OK, Yes, I love this butterfly. It’s brown reminds me of the delicious hat store I used to frequent on Madison Avenue in NYC, in an earlier life. You know those eye spots transfix me. 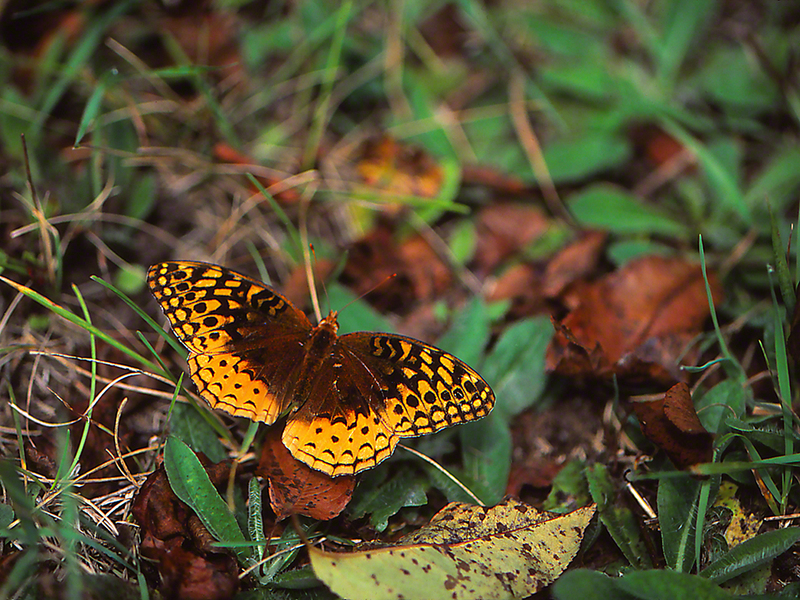 Thirdly, this is a very comely butterfly. Guilty as charged, magistrate. 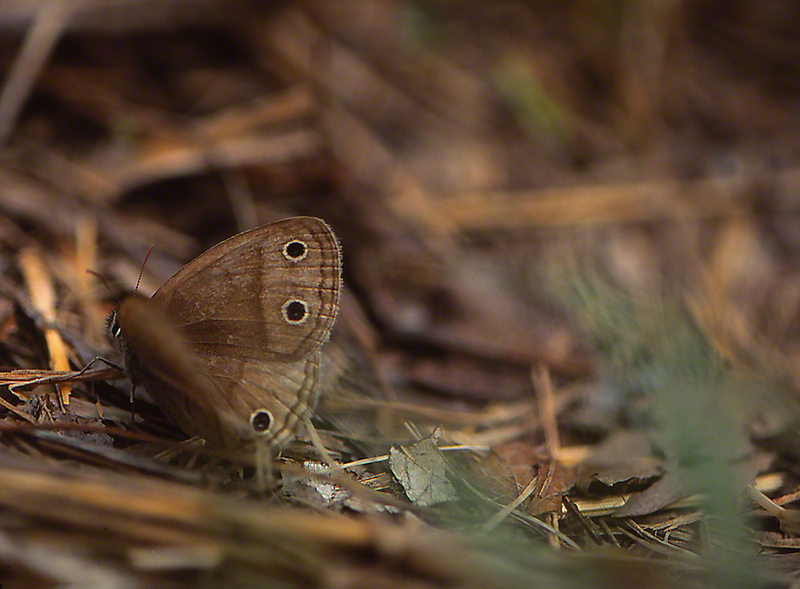 Cech and Tudor, in their superb Butterflies of the East Coast, share a happy bit of new, that Little Wood Satyrs are “a successful species.” Good news that, no? No, I’m Not a Monarch! Each day we learn more about animals. Dogs, we are now told, think. Cats do too. 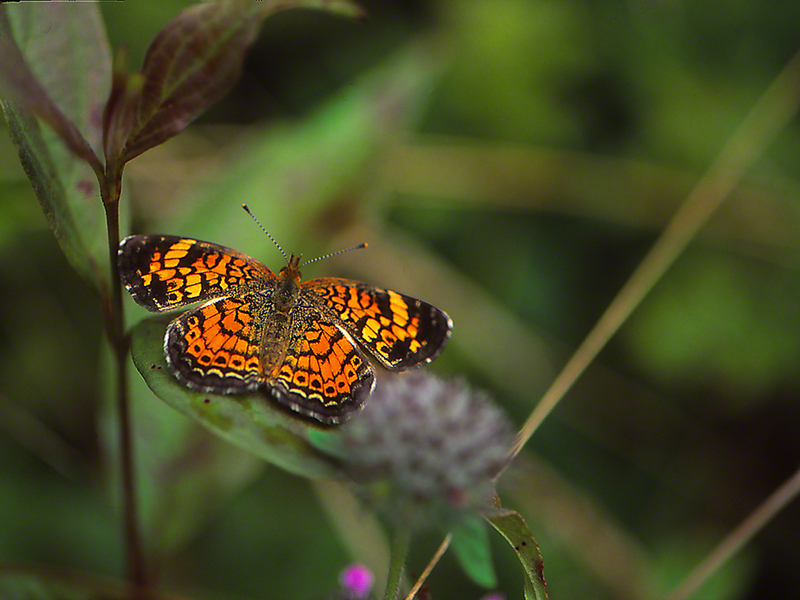 Those of us who spend considerable time amongst butterflies often wonder, do they, can they think? Problem solve? Do they flee because of instinct, or do they decide when and if to go? Butterflies certainly might, if they can reason at all, exasperate, because we lavish so much attention upon Monarchs, Tiger Swallowtails, Coral hairstreaks, Giant Swallowtails, and pay little or no attention to the likes of this stunner, a shmeksy female Pearl Crescent butterfly (Phyciodes Tharos). She was warming up her wings on a sunny August morning along a trail in Doak Field, Raccoon Creek State Park, on the western side of Pennsylvania.